For centuries, scholars have speculated about a lost book of the Bible. No one has ever found it--until now. A few pieces of centuries-old parchment tucked inside a tattered book lead famed archaeologist Jonathan Weber and his wife Shannon to what could possibly be the greatest find in church history--a discarded biblical manuscript whose ancient pages reveal a secret that will change the way the world views Scripture. Is it one of fifty copies commissioned by Constantine the Great and lost for centuries? Or the most sophisticated forgery of all time? When the manuscript is stolen, Jon is swept into a deadly race to find it and prove its authenticity before it's lost forever. Everything hangs in the balance--his career, his reputation, even his life--but he's willing to risk it all in one final daring attempt to determine the truth. 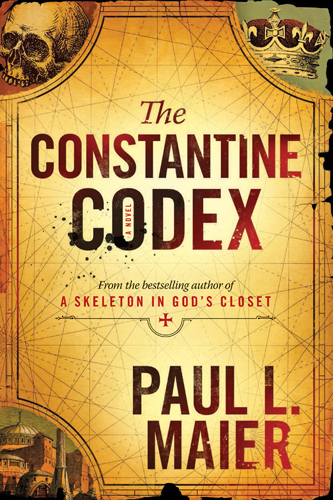 Although today is the blog tour for The Constantine Codex, I have to start by telling you that I haven't yet finished reading the book. It's not a quick read, but that's because the language is very rich. I'm enjoying the story so much that I don't want to rush to finish it! I don't think The Constantine Codex would be categorized as historical fiction. The story takes place in the present day, but I think the inclusion of history into the story will make it more appealing to readers who are fascinated by history. As I mentioned, the writing in this book is verbally rich and, at times, challenging. I've been reading it while I'm waiting in the hospital, where I don't have a dictionary close at hand. I've bookmarked a couple of pages to remind me to look up words--such as solipsistic--that just don't pop up in everyday conversation. Disclosure: I received a copy of this book, at no cost to me, for review purposes. Thanks to Glass Road PR for the opportunity! I was not required to write a positive review, and all opinions in this post are my own.